“Look, there’s a crab right there,” my hiking companion said. Technically it wasn’t a jungle; it was a rainforest. Well, according to the guide, it wasn’t a rain forest so much as it was a “humid” forest. Still, it seemed jungle-like to me. There were palm trees; there were mimosas; there were tangled roots everywhere; and there were certainly leaves: big leaves, little leaves, medium-sized leaves; leaves that were dried and curled, leaves that were still green and damp from the previous day’s rains; leaves that were being chopped up by leafcutter ants and carried across the trail in industrious little lines. What I didn’t see was the crab. Of course, I also couldn’t see most of the birds that everybody else was seeing, either. This part rather defeated the purpose, since that’s why we were on the Pipeline Trail in the first place: for bird watching. We had traveled twenty miles from Panama City to get to the Pipeline Trail and its humid-or-at-least-slightly-more-than-moist forest. All the way, the road we had been on flanked the Panama Canal, that mosquito friendly transportation artery connecting the Caribbean to the Pacific. Massive cargo ships snailed their way along the Canal, sharing the space with Navy ships from a variety of countries, pleasure yachts from a variety of millionaires, and fishing boats from a variety of local guys who wore ratty shirts and, from what I’d heard, snazzy white fedoras. The Pipeline Trail had originally been constructed to provide the U.S. Army with a means of mobilizing and moving troops quickly along the length of the Canal. It was never used for that purpose and eventually fell into disrepair. When the Panamanians took over the old Army base and turned it into a resort hotel (Gamboa Resort), they also decided to turn the Pipeline into a trail. Ten miles of it has been reclaimed so far. It’s known as the best birding in Central America: a place where you can sometimes see 250 species of birds in a morning of birdwatching. 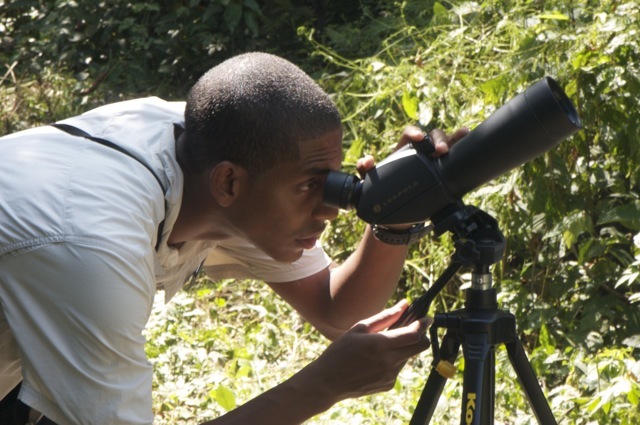 Our guide spots some birds through his super-scope. Mind you, the key word there is “morning,” so of course we were there in the afternoon. Also, with apologies to my grandfather and his collection of bird books, bird watching has always ranked up there for me at about the excitement level of televised bowling and the spirited activities associated with raising pet rocks. I’ll admit that this opinion is influenced by my chronic inability to see whatever it happens to be that I’m looking for: arrowheads, mushrooms, birds, the remote, meaning in the “career” of Paris Hilton … whatever. My companions would be pointing out things (“There’s a duck-billed pheasant-feathered Norwegian-German brush hawk right there on that limb. Don’t you see it?”) and all I’d see was a branch. Half the time, even when the guide set up his 7 million x birding scope, all I’d see was a branch. 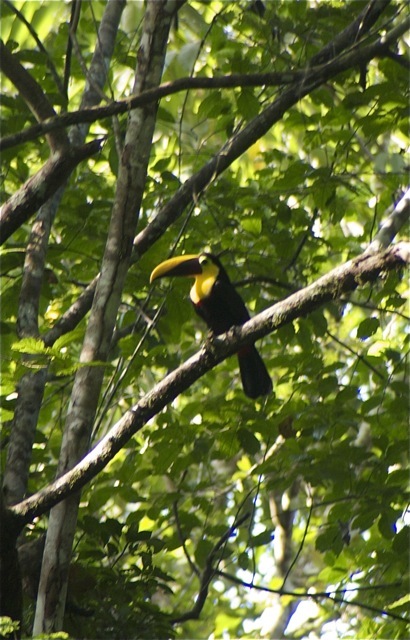 Finally, though, we came across some birds too big for even me to miss: toucans. Yup, just like in that old cereal commercial, where Toucan Sam hawked (that’s a pun, folks) multi-colored loops of fruit. These toucans didn’t talk, but they looked roughly the same: vibrantly-colored beaks, bright plumage, tiny little safari jackets. Okay, maybe those weren’t safari jackets; might have been photographer’s vests. Same idea, though. A toucan observes the author observing him. Shortly after the toucans, a group of white-faced monkeys leaped from limb to limb through the treetops, much like birds, though one was crossing the trail carrying her baby on her back. Then we saw an anteater and another flock of toucans. Wildlife galore. 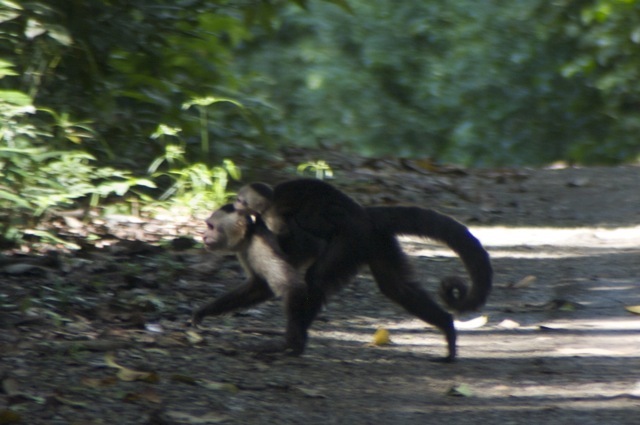 A monkey crosses the trail while carrying her baby on her back. As we were crossing a bridge over a small stream, there came echoing through the forest a long, low sound that built up in volume until it mimicked that moment right before a car wreck, when everyone’s brakes are moaning and tires are trying to grip the asphalt. “What’s that?” I asked quietly. The nature of the sound induced a sort of library-like quietude in the forest. It was a haunted sound, a foreboding sound. “Howler monkeys,” the guide said. We couldn’t see them, but the sound went on and on for several minutes. It’s possible that they were upset because they couldn’t spot the crab under the leaf. OK, I don’t feel so bad anymore. I never saw what Pa was telling me to look for. I remember frog hunting with him once. He pointed out the frog on the edge of the pond. I never saw it. He had to take me head, point it in the direction of my prey and point his finger before I saw it. I got glasses shortly after that. And by the way, I thought it was white “fat man” Panama shirts with straw fedoras?